What began in 1982 with an internet connected Coca-Cola machine that could order its own refills, now includes dishwashers, cars, robots, traffic lights, and anything else that might benefit from collecting and acting on shared data. Experts predict that, by 2020, 50 billion such devices will have joined the IoT. But to fit this feature onto six pages, we'll focus on the smart home and wearables, because that's where the IoT is having its most immediate and beneficial impact. In fact, the government believes that by 2019, 69 per cent of UK homes will have connected devices, and has invested around £40million in the Internet of Things. Your own investment could be something as modest as a lightbulb capable of joining your home network so that you can turn it on or off using an app on your phone. Or you could install a rather more sophisticated system that simultaneously turns on the lights, dials up your thermostat and wakes up the coffee machine when it senses that you're on your way home from work. The GPS module in your smartphone is what would give you away. Sound clever? Well, it's easier to install than you think – there's certainly no wiring to worry about. The way all these sensors and actuators work together is made possible by the fact that we all now have a home Wi-Fi network and a smartphone. Consider the humble kettle again for a moment. With the addition of an inexpensive circuit, a sensor and a companion app for a smartphone, manufacturers can offer a smart kettle that lets you not only boil water while you're out of the room, but also check how much water remains and find out the temperature. OK, so on its own the smart kettle probably isn't going to change your life, but the IoT gets more interesting when the 'Things' also talk to each other. The smart thermostat is, for many, where home automation begins, and it makes an ideal hub for inﬂuencing other IoT devices. There are obvious advantages in being able to check up on your central heating when you're away, but when that temperature data is shared with your smart smoke alarm and other connected kit, steps can be taken without your intervention. In the event of a fi re, for example, the thermostat will confirm a sharp temperature rise, and automatically turn off the gas and switch on all your lights to a brightness best suited for seeing through smoke, while alerts are sent to your phone. For all of this to happen, you need compatibility between the various devices. As you might expect, the Nest Learning Thermostat works with the Nest Protect smoke alarm, and parent company Google has encouraged a whole ecosystem of products from other brands that use the same platform. So anything bearing the 'Works With Nest' logo on its packaging – such as LIFX's smart bulbs – will be a cinch to synchronise with Nest. 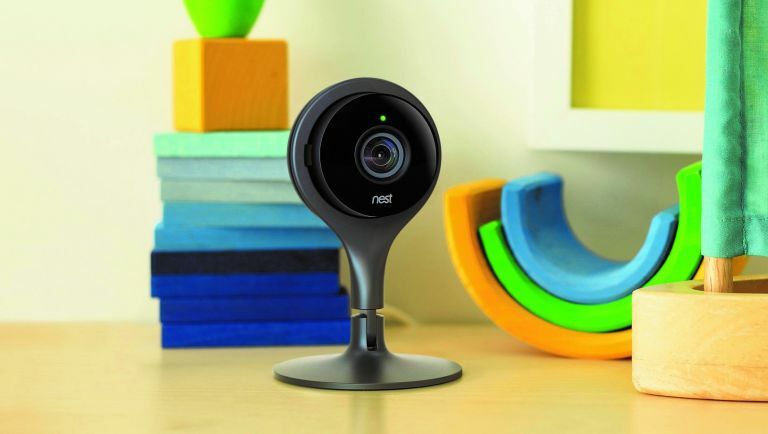 All of Nest's products can be controlled via the proprietary app, while third-party Works With Nest devices usually have their own apps but work seamlessly with Nest. On buying up SmartThings, Samsung became another big-hitter in the IoT league, and its Arctic platform makes it exceptionally easy to use your Galaxy phone to operate your lights and home security system. Meanwhile, Microsoft, Sony, Philips and some other major electronics brands use a system called AllJoyn by Qualcomm. T3's advice is to pick your platform based on the kit you already have if you want an easy life, but that's not to say the various protocols are completely incompatible. Apple has also jumped on the IoT bandwagon, with its HomeKit ecosystem. This enables you to control the HomeKit badge-holders around your home with a quick instruction to Siri, and also works seamlessly with Apple TV. So, say you're watching your favourite programme and you want to know what's happening in baby's room – just ask Siri, and HomeKit will 'speak' to your Withings Home baby monitor, before beaming the picture straight onto your TV screen. What Apple TV won't currently do is show you a feed of your Nest Cam, which uses Google software. However, there's nothing to stop third-party app developers bringing some much-needed inter-brand compatibility. You can already watch a live video feed from your Nest camera on your Apple Watch, thanks to a nifty WatchOS app called Drop. And while Philips Hue officially works with Nest, it works just as well with Samsung and Apple products, too. Indeed, the slick Hue app on the Apple Watch is a favourite in the T3 office. When you can make all of the lights in your home change colour in time with the music you've got playing, just by tapping your Apple Watch, it's hard not to feel a little like the Fonz snapping his fingers. So how can a sensor in one IoT 'Thing' trigger the desired action in a different 'Thing'? That's where an ingenious enabler app called IFTTT comes in. If This Then That blends two different apps in what it calls a 'recipe' to induce the desired result. For example, when the location app on your phone indicates that you're entering the vicinity of your house, it triggers your Hue app to turn on the door light, or your August app to unlock the door, or your coffee-machine app to put on a brew. We've been dreaming of smart homes for decades, and a lucky few have even been living in them. But before the Internet of Things, that meant custom installers hardwiring proprietary systems that came with a baﬄingly expensive Crestron or AMX remote control just to dim the lights. In the age of the smartphone, we can assume that everyone has their own supercomputer with a perfect touchscreen interface right in their pocket, so the rest of the system can be simple and cheap – a lightbulb with a Wi-Fi module in it, for example. The clever stuff is done by the companion app, and that's usually the best way to judge an IoT 'Thing'. The IoT is here to make our lives easier, and a smart gadget with an app that can find your wireless network and set itself up is a great start. Security cameras, in particular, highlight just how far the IoT has taken us from the dark days of CCTV. Nowadays, there are dozens of affordable camera options, and, happily, none of them take more than five minutes to get online. Door locks have taken a little longer to join the IoT. Perhaps it's our innate, and not unfounded distrust of tech – but the benefits are clear. With brands such as Yale joining August and Lockitron in offering Bluetooth deadbolts that release on wireless command and MasterLock offering Bluetooth padlocks, we no longer need to faff around looking for our keys. That said, we'll keep our T3 key ring in our pocket, just to be sure. The kitchen, on the other hand, has always been a fertile ground for connectivity, with internet fridges showing up at electronics trade shows every year. For a long time, these white elephants with their emails telling you that the milk is going sour never found their niche, but in the smartphone era their interior cameras are proving extremely useful. Now you can simply glance at your smartphone – or, indeed, smartwatch – the next time you're in Tesco to see exactly what you need. AEG has just applied a similar science to a steam oven, the ProCombi Plus Smart. This time, the internal camera enables you to watch your joint of meat cooking from your iPad, and adjust the temperature while you sit back and catch up on your favourite TV programmes. Naturally, the app also covers the company's other smart kitchen kit. Brands like Miele and Bosch are also exploring the Internet of Things, working on appliances that expand their functionality by joining your network. Smart washing machines that will begin their cycle with the touch of a smartphone, then send an alert when it's finished, are a good example. In all of these scenarios, it's our smartphones that are the universal controllers making things happen, but our personal devices just got even more personal with the arrival of wearable tech. Smartwatches and wristbands make the IoT yet more accessible by enabling us to leave our phones in our pockets. Many IoT devices, like locks and wireless speakers, need only to be touched to make an NFC connection, or require just one tap to switch on the lights. They might rely on the smartphone app for more in-depth commands, but for the most part our mobiles can remain in our pockets. If the IoT is here to make our lives easier, then this seamless integration with wearable tech is the latest logical progression on a path towards the perfect smart home. Instead of fumbling with smartphones, our smart devices will simply know where we are and have a good idea of what we want them to do. Otherwise, a prompt from a smartwatch will nudge them into action. If you want to usher in the IoT right now, and surround yourself with helpful and proactive connected devices, there are already plenty to choose from. Be it heating, lighting, entertainment, security, cooking or cleaning, T3 can recommend a smart device that's ready and eager to help.